Happy May People!!! 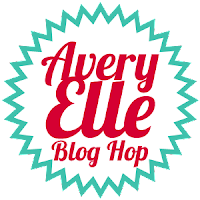 Are you enjoying the Avery Elle May Blog Hop? So many fun things are coming out this month! 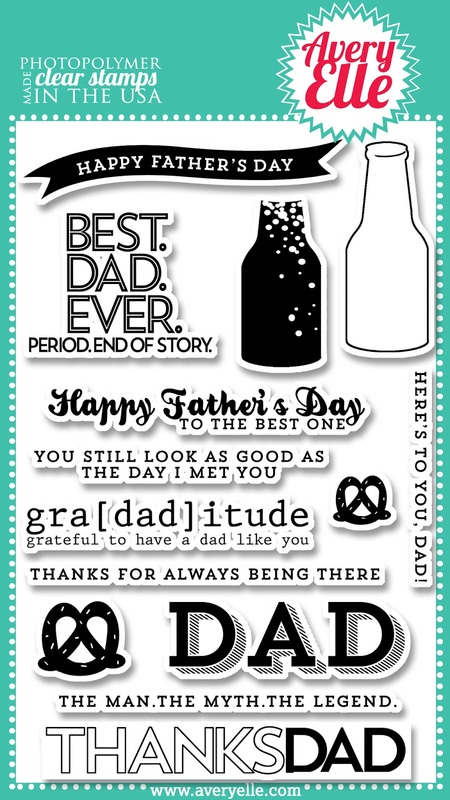 My first card today uses the awesome new Father's Day set called The Man! I can always use more masculine sets, and I love the style of this one. Modern, fresh, and loving without being sappy:) You laugh, but that combo is hard to find! My second card is a quickie that I made using one of the new dies I introduced earlier this week in this post. For this card I used the Chevron Border in a slightly different way! To get this look, I layered 3 chevron borders in 3 different colors. All 3 layers were glued together and glued to the card base under a circle cut out. A simple and compact sentiment from All Squared Up was the perfect sentiment to finish it off! Are you thinking how you could do this other colors? Fun, right? 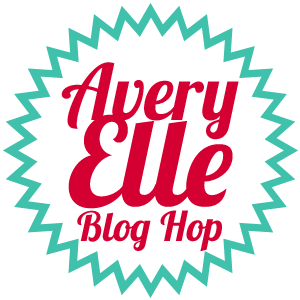 Don't forget, to celebrate the May Release Blog Hop, Avery Elle is giving away a $25 Gift Certificate to one winner! You have until Sunday, May 5th midnight EST to enter. The winner will be announced on the Avery Elle blog on Monday, May 6th. All products are available for purchase in the Avery Elle store right NOW!!! Just wonderful! LOVE the pop bottle, and the "bubbles"! Oh my goodness!! I am SO in trouble this month. Love everything and that pop card is ridiculously cute! LOVE the pop card! So cute! Love the pop card and the enamel dots bubble. Wonderful cards! I love that new chevron die. That soda card is just so adorable!!! TFS!!! These are so fantastic! Enamel bubbles?!? Yes please! We are so fortunate to have you on board with us. You are the best!!! Love these JJ! The enamel dots on the first one are so fun, but the second is my favorite. LOVING those new dies! My problem with most sentiment sets is that they are "sappy". I want to say it plain and simple. This is a great stamp set. Love your cards. Love these cards. The pop card is really fun & those chevron dies you designed are fabulous & you are doing some great things with them. Thanks so much. Love the "pop" from your pop! So clever! And your chevron dies are going to be such a hit! So exciting to be on the AE team with you! So cool - love the pop card with the bubbles of fizz! BOTH OF YOUR CARDS ARE VERY CUTE!! That pop card just rocks :) I really love the matching bubbles! And the chevrons...love the colours, and the whole die concept is fabulous. Honestly! I'm going to have to get out the thesaurus so I can find more interesting ways of saying 'fabulous' and 'genius'!! Love your orange pop card. The enamel dots are fabulous I have those, but I love how you used them. 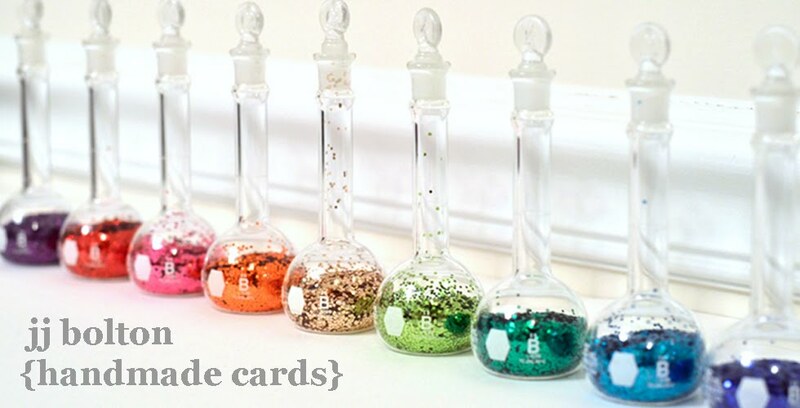 Great tip about stamping the inside first, that would work good for my PTI Love Potions set too. Love the first card - it really pops! Your "pop" card is so fun, love the enamel bubbles! Those orange bubbles are super fun!!! And the layered chevron is AWESOME!! LOVE IT! So cute! Love the bubbles coming out of the bottle! 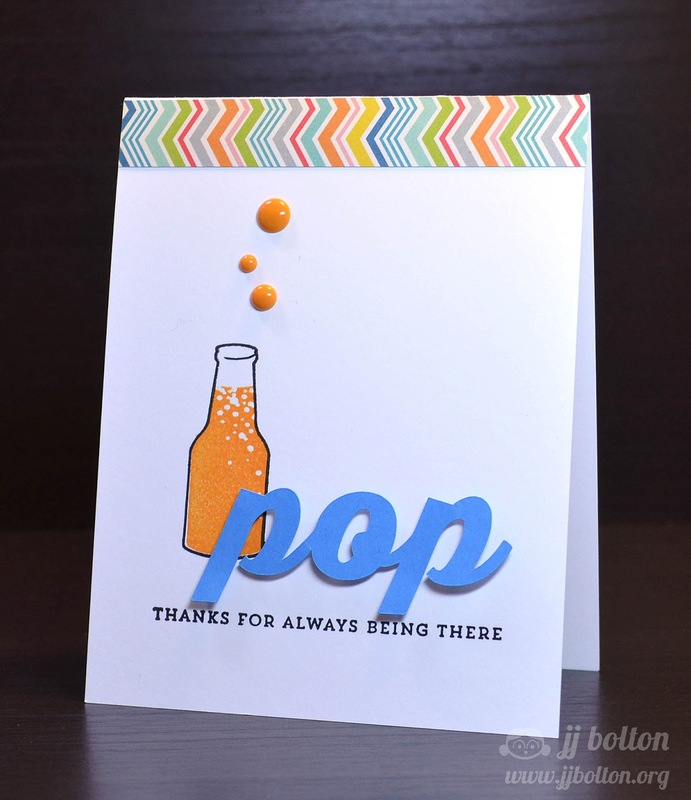 Great card designs--love the pop bottle. BOth of these are stunning cards! How clever and talented you are. Love both cards. Really great graphic design! I especially love your POP card. I love puns. I just love the POP card you made, it is so cute! Gotta get this stamp set so I can make my husband a father's day card using the bottle with bubblies...he's a homebrewer! These are such super adorable cards! I love how you used the enamel dots! So fun! Great cards! Love the new stamps and dies! I find masculine cards difficult too but you seem to have no problem. I LOVE the 2nd card the best! Amazing! As always, your cards are just amazing, JJ! I think these new stamps and dies are so versatile...can't wait to start playing with them! Boy, you really NAILED these two cards. They're so well designed and the colors ROCK! I absolutely adore your first design, especially how you were able to make it cute and colorful but still perfect for a guy. And those chevrons--swoon! Such fun cards, JJ! I especially love your clever first card! Love them! I especially love the Pop card! I'm loving this set...a lot! Both are awesome but I am totally digging that colourful masculine 'Pop' card! Great design JJ!! Oh, these are such clever cards! !